Judas Tree – thought to be the tree Judas Iscariot Hung himself on. Pipe tree – It’s soft pith can be pushed out leaving a pipe shaped empty stem. It has been said, with some truth, that our English summer is not here until the Elder is fully in flower, and that it ends when the berries are ripe. The word ‘Elder’ comes from the Anglo-Saxon word Æld. In Anglo-Saxon days we find the tree called Eldrun, which becomes Hyldor and Hyllantree in the fourteenth century. One of its names in modern German – Hollunder – is clearly derived from the same origin. In Low-Saxon, the name appears as Ellhorn. Æld meant ‘fire,’ the hollow stems of the young branches having been used for blowing up a fire: the soft pith pushes out easily and the tubes thus formed were used as pipes – hence it was often called Pipe-Tree, or Bore-tree and Bour-tree, the latter name remaining in Scotland and being traceable to the Anglo-Saxon form, Burtre. Common throughout Britain with the exception of northern Scotland up to altitudes of 470 m and has been introduced to Orkney and Shetland. It is widespread in Europe but becomes scarce in the extreme north. It is also found in western Asia, North Africa and the Azores. Its Latin name is Sambucus Nigra and botanically it was formerly thought to belong to the honeysuckle (caprifoliaceae) family but now shown by genetic evidence to be correctly classified in the moschatel family Adoxaceae. The genus is native to temperate to subtropical regions of both the Northern Hemisphere and the Southern Hemisphere; the genus is more widespread in the Northern Hemisphere, with Southern Hemisphere occurrence restricted to parts of Australasia and South America. The elder is not quite large enough to be classed as a tree, but is too large for a bush. It is a strange ‘tree’ of many contrasts. The heartwood can be extremely hard, yet the branches are weak and barely able to support themselves. It produces clumps of creamy-white sweet-smelling flowers but the leaves give off an unpleasant pungent smell, similar to the smell of mice nests, as the alternative name ‘God’s stinking tree’ attests. Thrives in disturbed fertile soils in a wide range of habitats including waste ground, roadsides, woods, grassland and railway banks. It is very tolerant of rabbit grazing and is a common feature around warrens. Elder is a large (10 to 20 feet), deciduous multi-stemmed shrub or small tree that grows very quickly and suckers to form colonies. It is bushy, open and upright, with arched branches. The young shoots are light grey with distinctly visible raised bumps, or lenticels. The old bark matures to become deeply furrowed and corky in texture. Found in sites with sun to partial shade; moist, well-drained soil. Species have lifespans between 80 and 100 years. The botanist finds in this plant an object of considerable interest, for if a twig is partially cut, then cautiously broken and the divided portions are carefully drawn asunder, the spiral air-vessels, resembling a screw, may be distinctly seen. The stalked, divided leaves, are opposite, pinnate compound and dark green with 3 to 9 leaflets and an unpleasant odor when crushed, each leaf 5-30 cm long, the leaflets with a serrated margin. They are present from March through to November and it is in flower from June to July, with large clusters of yellowish white flowers on 5 to 8″ flat-topped cyme. The aromatic flowers are pollinated by small flies and other insects. Elder berries are small, globe shaped and a deep purplish-black in colour ripening from August to September, and have been harvested for centuries for a huge range of purposes. The fruit attracts birds. These are rich in vitamin C. The berries are best not eaten raw as they are mildly poisonous, causing vomiting (particularly if eaten unripe). The mild cyanide toxicity is destroyed by cooking. All green parts of the plant are poisonous, containing cyanogenic glycosides (Vedel & Lange1960). Elder is resistant to rabbit-grazing and it provides nesting opportunities for blackbirds, song thrushes, chaffinches and bullfinches. They are a favourite food of birds, including various warblers, elders are used as food plants by the larvae of some Lepidoptera species including Brown-tail, Buff Ermine, Dot Moth, Emperor Moth, The Engrailed, Swallow-tailed Moth and The V-pug. Elder can be grown from seed, simply plant the ripe berries in pots outdoors. Plant in drills about 2cm (1 inch) deep. When they have grown to a size that allows you to manage, plant in semi shade. Elder will tolerate most soils; if you have a chalky site then Sambucus nigra is very good. It is also possible to grow Elder from semi-hardwood cuttings, taken from new growth. A 30cm (1ft) cutting should be taken and placed in a coir, grit and compost mix then wintered in a cold frame or greenhouse. Plant out when the weather is colder, ready or the following spring. Elder should be havily cut back in the winter as it can quickly take over your garden! The Sambucus nigra ‘Aurea’ is a good variety to try in a container. Ensure that the containers are large enough and that you can give the plant some shade. Keep well watered in dry weather and feed occasionaly. A number of garden cultivars exist, with cut-leaved gold or purple foliages. These can be improved by annual pruning to make the shrub even more bushy and dense. Albo-variegata; Marginata: Leaves initially have yellowish white margins, fading to creamy white. The uses of elder, of leaves, bark, wood, flowers and berries are many and varied. The shrub has been used for centuries as a fast-growing hedgerow plant. The hard heart wood of old trees is white and of a fine, close grain, easily cut, and polishes well, hence it was used for making skewers for butchers, shoemakers’ pegs, and various turned articles, such as tops for angling rods and needles for weaving nets, also for making combs, mathematical instruments and several different musical instruments, was highly valued and the pith, one of the world’s lightest natural solids, is still used today for holding small biological specimens in microscopy. Hollowed-out stems make excellent pea-shooters and ‘guns’ for children. The leaves have been used to protect livestock from flies, and for various medicinal purposes, including soothing wounds, bruises and headaches. Indeed, elder was something of a cure-all, with every part of the shrub being used to treat a plethora of ills ranging from toothache to the plague. The use of the bark as a purgative dates back to Hippocrates, while today, elder flower water is still used for skin problems and as an eye wash. The main surviving uses for elder are culinary. Elder-flower cordial and wine (once known as elder-flower champagne) are still popular today. The berries are made into jellies, jams, syrups, wines, and relishes and the flowers can be battered, fried and eaten as fritters. The leaves have an unpleasant odour when bruised, which is supposed to be offensive to most insects, and a decoction of the young leaves is sometimes employed by gardeners to sprinkle over delicate plants and the buds of the flowers to keep off the attacks of aphids and minute caterpillars. Moths are fond of the blossoms, but it was stated by Christopher Gullet (Phil. Trans., 1772, LXII) that if turnips, cabbages, fruit trees or corn be whipped with bunches of the green leaves, they gain immunity from blight. Though this does not sound a very practical procedure, there is evidently some foundation for this statement, as the following note which appeared in the Chemist and Druggist, January 6, 1923, would seem to prove: ‘A liquid preparation for preventing, and also curing, blight in fruit trees, wherein the base is a liquid obtained by boiling the young shoots of the Elder tree or bush, mixed with suitable proportions of copper sulphate, iron sulphate, nicotine, soft soap, methylated spirit and slaked lime.’ The leaves, bruised, if worn in the hat or rubbed on the face, prevent flies settling on the person. In order to safeguard the skin from the attacks of mosquitoes, midges and other troublesome flies, an infusion of the leaves may be dabbed on with advantage. Gather a few fresh leaves from the elder, tear them from their stalks and place them in a jug, pouring boiling water on them and covering them at once, leaving for a few hours. When the infusion is cold, it is fit for use and should be at once poured off into a bottle and kept tightly corked. It is desirable to make a fresh infusion often. The leaves are said to be valued by the farmer for driving mice away from granaries and moles from their usual haunts. The bark of the older branches has been used in the Scotch Highlands as an ingredient in dyeing black, also the root. The leaves yield, with alum, a green dye and the berries dye blue and purple, the Juice yielding with alum, violet; with alum and salt, a lilac colour. Elder Flowers and Elder Berries have long been used in the English countryside for making many home-made drinks and preserves that are almost as great favourites now as in the time of our great-grandmothers. The berries make an excellent home-made wine and winter cordial, which improves with age, and taken hot with sugar, just before going to bed, is an old-fashioned and well established cure for a cold. In Kent, there are entire orchards of Elder trees cultivated solely for the sake of their fruit, which is brought regularly to market and sold for the purpose of making wine. The berries are not only used legitimately for making Elderberry Wine, but largely in the manufacture of so-called British wines – they give a red colour to raisin wine – and in the adulteration of foreign wines. Judiciously flavoured with vinegar and sugar and small quantities of port wine, Elder is often the basis of spurious ‘clarets’ and ‘Bordeaux.’ ‘Men of nice palates,’ says Berkeley (Querist, 1735), ‘have been imposed on by Elder Wine for French Claret.’ Cheap port is often faked to resemble tawny port by the addition of Elderberry juice, which forms one of the least injurious ingredients of factitious port wines. Doctoring port wine with Elderberry juice seems to have assumed such dimensions that in 1747 this practice was forbidden in Portugal, even the cultivation of the Elder tree was forbidden on this account. The practice proving so lucrative, however, is by no means obsolete, but as the berries possess valuable medicinal properties, this adulteration has no harmful results. The circumstances under which this was proved are somewhat curious. In 1899 an American sailor informed a physician of Prague that getting drunk on genuine, old, dark-red port was a sure remedy for rheumatic pains. This unedifying observation started a long series of investigations ending in the discovery that while genuine port wine has practically no anti-neuralgic properties, the cheap stuff faked to resemble tawny port by the addition of elderberry juice often banishes the pain of sciatica and other forms of neuralgia, though of no avail in genuine neuritis. Cases of cure have been instanced after many tests carried out by leading doctors in Prague and other centres abroad, the dose recommended being 30 grams of Elderberry juice mixed with 10 grams of port wine. 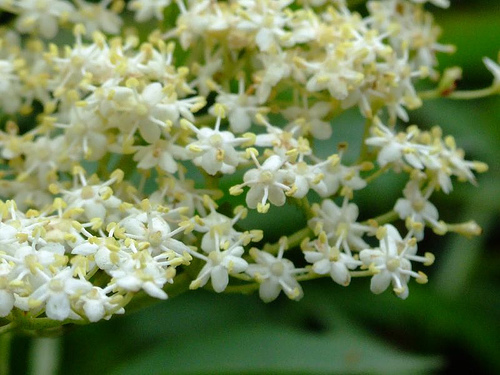 Elderflower as a food As a food it should never be eaten raw as the flowers, like the berries, contain a mildly poisonous alkaloid which is destroyed by cooking. It has widely been used as a food and native Americans would cook them in fritters. Elderflower fritters. An early summer delicacy and very easy to make. Mix all the ingredients apart from the elderflower. Heat some oil in a pan or deep fat fryer, Dip flower head in batter and fry until golden brown. A pinch of cinnamon can be added to the batter to add extra flavour and the fritters can be rolled in sugar although this is not always needed if there is sugar in the batter . Elderflower Cordial. There are countless recipes for elderflower cordial. • Place a layer of elder flowers in the bottom of a bucket and cover it with a layer of sugar • Repeat this until the bucket is full • Cover the bucket’s contents with boiling water and leave overnight. • Strain and bottle the contents of the bottle. Elderflower cordial can be put in plastic bottles and frozen. The classic self-sufficient writer John Seymour claims the secret of good cordial is, ‘never put too many in your brew’ and ‘harvest on a sunny day when the fragrance and nectar are at their height’. It’s very cheap to make, with sugar being the most expensive ingredient, so it is worth experimenting with until you perfect your own recipe. The sugar content does seem to be on the high side but as with jams this is ensuring the food is preserved. Other ingredients such as citric acid and lemon juice do appear in many recipes. Citric acid can be found in many places such as chemists, some ethnic supermarkets and health food shops. It is worth having a little bag in the kitchen, as it is an antioxidant and will increase the shelf life of many foods. Another Recipe. Equal quantities of Elderberries and Apples, 3/4 lb. sugar and one lemon to each pound of fruit. Strip the berries from the stalks, peel, core and cut up the apples and weigh both fruits. Put the Elderberries into a pan over low heat and bruise them with a wooden spoon. When the juice begins to flow, add the Apples and one-third of the sugar and bring slowly to the boil. When quite soft, rub all through a hair sieve. Return the pulp to the pan, add the rest of the sugar, the grated lemon rind and juice and boil for half an hour, or until the jam sets when tested. Remove all scum, put into pots and cover. Parkinson tells us that fresh Elder Flowers hung in a vessel of new wine and pressed every evening for seven nights together, ‘giveth to the wine a very good relish and a smell like Muscadine.’ Ale was also infused with Elder flowers. Elderberry Jam without Apples. To every pound of berries add 1/4 pint of water, the juice of 2 lemons and 1 lb. of sugar. Boil from 30 to 45 minutes, until it sets when tested. Put into jars and tie down when cold. The juice from Elder Berries, too, was formerly distilled and mixed with vinegar for salad dressings and flavouring sauces. Vinegars used in former times frequently to be aromatized by steeping in them barberries, rosemary, rose leaves, gilliflowers, lavender, violets – in short, any scented flower or plant though tarragon is now practically the only herb used in this manner to any large extent. The pickle made from the tender young shoots – sometimes known as ‘English Bamboo’ – is more elaborate. During May, in the middle of the Elder bushes in the hedges, large young green shoots may be observed. Cut these, selecting the greenest, peel off every vestige of the outer skin and lay them in salt and water overnight. Each individual length must be carefully chosen, for while they must not be too immature, if the shoots are at all woody, they will not be worth eating, The following morning, prepare the pickle for the Mock Bamboo. To a quart of vinegar, add an ounce of white pepper, an ounce of ginger, half a saltspoonful of mace and boil all well together. Remove the Elder shoots from the salt and water, dry in a cloth and slice up into suitable pieces, laying them in a stone jar. Pour the boiling mixture over them and either place them in an oven for 2 hours, or in a pan of boiling water on the stove. When cold, the pickle should be green in colour. If not, strain the liquor, boil it up again, pour over the shoots and repeat the process. The great art of obtaining and retaining the essence of the plant lies in excluding air from the tied-down jar as much as possible. The young shoots can also be boiled in salted water with a pinch of soda to preserve the colour, they prove beautifully tender, resembling spinach, and form quite a welcome addition to the dinner table. Elderberry Chutney. 2 lb. Elderberries, 1 large Onion, 1 pint vinegar, 1 teaspoonful salt, 1 teaspoonful ground ginger, 2 tablespoonsful sugar, 1 saltspoonful cayenne and mixed spices, 1 teaspoonful mustard seed. Another Recipe. Rub 1 1/2 lb. of berries through a wire sieve, pound 1 onion, 6 cloves, 1/4 oz. ground ginger, 2 oz. Demerara sugar, 3 oz. stoned raisins, a dust of cayenne and mace, 1 teaspoonful salt and 1 pint vinegar. Put all in an enamelled saucepan and boil with the pulp of the berries for 10 minutes. Take the pan from the fire and let it stand till cold. Put the chutney into jars and cork securely. Elderberry Ketchup. 1 pint Elderberries, 1 OZ. shallots, 1 blade mace, 1/2 oz. peppercorns, 1 1/2 OZ. whole ginger, 1 pint vinegar. All parts of the tree – bark, leaves, flowers and berries – have long enjoyed a high reputation in domestic medicine. From the days of Hippocrates, it has been famous for its medicinal properties. It has been termed ‘the medicine chest of the country people’ (Ettmueller) and ‘a whole magazine of physic to rustic practitioners,’ and it is said the great physician Boerhaave never passed an Elder without raising his hat, so great an opinion had he of its curative properties. Some twenty years before Evelyn’s eulogy there had appeared in 1644 a book entirely devoted to its praise: The Anatomie of the Elder, translated from the Latin of Dr. Martin Blockwich by C. de Iryngio (who seems to have been an army doctor), a treatise of some 230 pages, that in Latin and English went through several editions. It deals very learnedly with the medicinal virtues of the tree – its flowers, berries, leaves, ‘middle bark,’ pith, roots and ‘Jew’s ears,’ a large fungus often to be found on the Elder (Hirneola auricula Judae), the name a corruption of ‘Judas’s ear,’ from the tradition, referred to above, that Judas hanged himself on the Elder. It is of a purplish tint, resembling in shape and softness the human ear, and though it occurs also on the Elm, it grows almost exclusively on Elder trunks in damp, shady places. It is curious that on account of this connexion with Judas, the fungus should have (as Sir Thomas Browne says) ‘become a famous medicine in quinses, sore-throats, and strangulation ever since.’ Gerard says, ‘the jelly of the Elder otherwise called Jew’s ear, taketh away inflammations of the mouth and throat if they be washed therewith and doth in like manner help the uvula,’ and Salmon, writing in the early part of the eighteenth century, recommends an oil of Jew’s ears for throat affections. The fungus is edible and allied species are eaten in China. Evelyn refers to this work (or rather to the original by ‘Blockwitzius,’ as he calls him!) for the comprehensive statement in praise of the Elder quoted above. It sets forth that as every part of the tree was medicinal, so virtually every ailment of the body was curable by it, from toothache to the plague. It was used externally and internally, and in amulets (these were especially good for epilepsy, and in popular belief also for rheumatism), and in every kind of form – in rob and syrup, tincture, mixture, oil, spirit, water, liniment, extract, salt, conserve, vinegar, oxymel, sugar, decoction, bath, cataplasm and powder. Some of these were prepared from one part of the plant only, others from several or from all. Their properties are summed up as ‘desiccating, conglutinating, and digesting,’ but are extended to include everything necessary to a universal remedy. The book prescribes in more or less detail for some seventy or more distinct diseases or classes of diseases, and the writer is never at a loss for an authority – from Dioscorides to the Pharmacopoeias of his own day-while the examples of cures he adduces are drawn from all classes of people, from Emylia, Countess of Isinburg, to the tradesmen of Heyna and their dependants. The interest in the Elder evinced about this period is also demonstrated by a tract on ‘Elder and Juniper Berries, showing how useful they may be in our Coffee Houses,’ which was published with The Natural History of Coffee, in 1682. Elder flower cordial is one of the most delicious drinks, and makes a fantastic home made sorbet for the summer. The flowers are ideal for colds and influenza. They are also good in aiding hay fever. The berries are ripe in autumn and are rich in vitamins A and C.
Use the flowers as an infusion for hay fever. Tincture for colds and influenza, use in early spring to reduce hay fever symptons. Berries used in syrup from decoction is good for winter colds, mixed with thyme. The Inner Bark should be collected in autumn, from young trees. It is best dried in a moderate sun-heat, being taken indoors at night. When ready for use, it is a light grey, soft and corky externally, with broad fissures; white and smooth on the inner surface. The taste of the bark is sweetish at first, then slightly bitter and nauseous. It is without odour. The active principle of the bark is a soft resin, and an acidViburnic acid, which has been proved identical with Valeric acid. Other constituents are traces of a volatile oil, albumen, resin, fat, wax, chlorophyll, tannic acid, grape sugar, gum, extractive, starch, pectin and various alkaline and earthy salts. (According to an analysis by Kramer in 1881.) The bark is a strong purgative which may be employed with advantage, an infusion of 1 OZ. in a pint of water being taken in wineglassful doses; in large doses it is an emetic. Its use as a purgative dates back to Hippocrates. It has been much employed as a diuretic, an aqueous solution having been found very useful in cardiac and renal dropsies. It has also been successfully employed in epilepsy. An emollient ointment is made of the green inner bark, and a homoeopathic tincture made from the fresh inner bark of the young branches, in diluted form, relieves asthmatic symptoms and spurious croup of children – dose, 4 or 5 drops in water. Culpepper states: ‘The first shoots of the common Elder, boiled like Asparagus, and the young leaves and stalks boiled in fat broth, doth mightily carry forth phlegm and choler. The middle or inward bark boiled in water and given in drink wortheth much more violently; and the berries, either green or dry, expel the same humour, and are often given with good success in dropsy; the bark of the root boiled in wine, or the juice thereof drunk, worketh the same effects, but more powerfully than either the leaves or fruit. The juice of the root taken, causes vomitings and purgeth the watery humours of the dropsy.’ Though the use of the root is now obsolete, its juice was used from very ancient times to promote both vomiting and purging, and taken, as another old writer recommends, in doses of 1 to 2 tablespoonsful, fasting, once in the week, was held to be ‘the most excellent purge of water humours in the world and very singular against dropsy.’ A tea was also made from the roots of Elder, which was considered an effective preventative for incipient dropsy, in fact the very best remedy for such cases. Elder leaves are used both fresh and dry. Collect the leaves in June and July. Gather only in fine weather, in the morning, after the dew has been dried by the sun. Strip the leaves off singly, rejecting any that are stained or insect-eaten. Drying is then done in the usual manner. Elder Leaves contain an alkaloid Sambucine, a purgative resin and the glucoside Sambunigrin, which crystallizes in white, felted needles. Fresh Elder leaves yield about 0.16 per cent of hydrocyanic acid. They also contain cane sugar, invertin, a considerable quantity of potassium nitrate and a crystalline substance, Eldrin, which has also been found in other white flowering plants. De Sanctis claims to have isolated the alkaloid Coniine from the branches and leaves of Sambucus nigra. Alpes (Proc. Amer. Pharm. Assoc., 1900) found undoubted evidence of an alkaloid in the roots of the American Elder (S. Canadensis), its odour being somewhat similar to that of coniine and also suggesting nicotine. This alkaloid was evidently volatile. It appeared to be much less abundant in the dried roots after some months keeping. The fresh root of S. Canadensis has been found extremely poisonous, producing death in children within a short time after being eaten with symptoms very similar to those of poisoning by Hemlock (Conium). 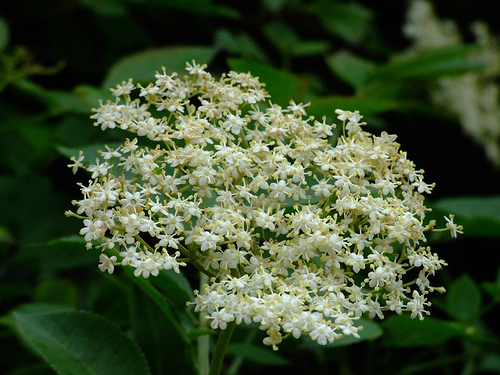 Elder leaves are used in the preparation of an ointment, Unguentum Sambuci Viride, Green Elder Ointment, which is a domestic remedy for bruises, sprains, chilblains, for use as an emollient, and for applying to wounds. It can be compounded as follows: Take 3 parts of fresh Elder leaves, 4 parts of lard and 2 of prepared suet, heat the Elder leaves with the melted lard and suet until the colour is extracted, then strain through a linen cloth with pressure and allow to cool. Sir Thomas Browne (1655) stated: ‘The common people keep as a good secret in curing wounds the leaves of the Elder, which they have gathered the last day of April.’ The leaves, boiled soft with a little linseed oil, were used as a healing application to piles. An ointment concocted from the green Elderberries, with camphor and lard, was formerly ordered by the London College of Surgeons to relieve the same complaint. The leaves are an ingredient of many cooling ointments: Here is another recipe, not made from Elder leaves alone, and very much recommended by modern herbalists as being very cooling and softening and excellent for all kinds of tumours, swellings and wounds: Take the Elder leaves 1/2 lb., Plantain leaves 1/4 lb., Ground Ivy 2 oz., Wormwood 4 oz. (all green); cut them small, and boil in 4 lb. of lard, in the oven, or over a slow fire; stir them continually until the leaves become crisp, then strain, and press out the ointment for use. Oil of Elder Leaves (Oleum Viride), Green Oil, or Oil of Swallows, is prepared by digesting 1 part of bruised fresh Elder leaves in 3 parts of linseed oil. In commerce, it is said to be generally coloured with verdigris. Like the bark, the leaves are also purgative, but more nauseous than the bark. Their action is likewise expectorant, diuretic and diaphoretic. They are said to be very efficacious in dropsy. The juice of Elder leaves is stated by the old herbalists to be good for inflammation of the eyes, and ‘snuffed up the nostrils,’ Culpepper declares, ‘purgeth the brain.’ Another old notion was that if the green leaves were warmed between two hot tiles and applied to the forehead, they would promptly relieve nervous headache. Elder Flowers are chiefly used in pharmacy in the fresh state for the distillation of Elder Flower Water, but as the flowering season only lasts for about three weeks in June, the flowers are often salted, so as to be available for distillation at a later season, 10 per cent of common salt being added, the flowers being them termed ‘pickled.’ They are also dried, for making infusions. The flowers are collected when just in full bloom and thrown into heaps, and after a few hours, during which they become slightly heated the corollas become loosened and can then be removed by sifting. The Elder ‘flowers’ of pharmacy consist of the small white wheel-shaped, five-lobed, monopetalous corollas only, in the short tube of which the five stamens with very short filaments and yellow anthers are inserted. When fresh, the flowers have a slightly bitter taste and an odour scarcely pleasant. The pickled flowers, however, gradually acquire an agreeable fragrance and are therefore generally used for the preparation of Elder Flower Water. A similar change also takes place in the water distilled from the fresh flowers. In domestic herbal medicines, the dried flowers are largely used in country districts and are sold by herbalists either in dried bunches of flowers, or sifted free from flower stalks. The flowers are not easily dried of good colour. If left too late exposed to the sun before gathering, the flowers assume a brownish colour when dried, and if the flower bunches are left too long in heaps, to cause the flowers to fall off, these heaps turn black. If the inflorescence is only partly open when gathered, the flower-heads have to be sifted more than once, as the flowers do not open all at the same time. The best and lightest coloured flowers are obtained at the first sifting, when the flowers that have matured and fallen naturally are free from stalks, and dried quickly in a heated atmosphere. They may be very quickly dried in a heated copper pan, being stirred about for a few minutes. They can also be dried almost as quickly in a cool oven, with the door open. Quickness in drying is essential. The dried flowers, which are so shrivelled that their details are quite obscured, have a dingy, brownish-yellow colour and a faint, but characteristic odour and mucilaginous taste. As a rule, imported flowers have a duller yellow colour and inferior odour and are sold at a cheaper rate. When the microscope does not reveal tufts of short hairs in the sinuses of the calyx, the drug is not of this species. Most pharmacopoeias specify that dark brown or blackish flowers should be rejected. This appearance may be due to their having been collected some time after opening, to carelessness in drying, or to having been preserved too long. The most important constituent of Elder Flowers is a trace of semisolid volatile oil, present to the extent only of 0.32, per cent possessing the odour of the flowers in a high degree. It is obtained by distilling the fresh flowers with water, saturating the distillate with salt and shaking it with ether. On evaporating the ethereal solution, the oil is obtained as a yellowish, buttery mass. Without ether, fresh Elder flowers yield 0.037 per cent of the volatile oil and the dried flowers 0.0027 per cent only. The flowers were used by our forefathers in bronchial and pulmonary affections, and in scarlet fever, measles and other eruptive diseases. An infusion of the dried flowers, Elder Flower Tea, is said to promote expectoration in pleurisy; it is gently laxative and aperient and is considered excellent for inducing free perspiration. It is a good oldfashioned remedy for colds and throat trouble, taken hot on going to bed. An almost infallible cure for an attack of influenza in its first stage is a strong infusion of dried Elder Blossoms and Peppermint. Put a handful of each in a jug, pour over them a pint and a half of boiling water, allow to steep, on the stove, for half an hour then strain and sweeten and drink in bed as hot as possible. Heavy perspiration and refreshing sleep will follow, and the patient will wake up well on the way to recovery and the cold or influenza will probably be banished within thirty-six hours. Yarrow may also be added.Elder Flower Tea, cold, was also considered almost as good for inflammation of the eyes as the distilled Elder Flower Water. A good ointment is also prepared from the flowers by infusion in warm lard, useful for dressing wounds, burns and scalds, which is used, also, as a basis for pomades and cosmetic ointments, Elder Flower Ointment (Unguentum Sambuci) was largely used for wounded horses in the War – the Blue Cross made a special appeal for supplies – but it is also good for human use and is an old remedy for chapped hands and chilblains. Equal quantities of the fresh flowers and of lard are taken, the flowers are heated with the lard until they become crisp, then strained through a linen cloth with pressure and allowed to cool. For use as a Face Cream, (This preparation is hardly suitable as a cosmetic, as lard induces the growth of hair.) the directions are a little more elaborate, but it is essentially the same: Melt lard in a pan then add a small cup of cold water and stir well. Simmer with the lid on for about an hour and finally let the mixture boil with the lid off until all the water has evaporated; this will have happened when, on stirring, no steam arises. Place on one side to cool a little and then pass the liquid fat through a piece of muslin so that it may be well strained and free from impurities. Take a quantity of Elder Flowers equal in weight to the lard and place these in the lard. Then boil up the mixture again, keeping it simmering for a good hour. At the end of that time, strain the whole through a coarse cloth and when cool, the ointment will be ready for use. All the other parts of the Elder plant, except the wood and pith, are more active than either the flowers or the fruit. Fresh Elder Berries are found to contain sudorific properties similar to those of the flowers, but weaker. Chemically, the berries furnish Viburnic acid, with an odorous oil, combined with malates of potash and lime. The fresh, ripe fruits contain Tyrosin. The Romans made use of Elderberry juice as a hair-dye, and Culpepper tells us that ‘the hair of the head washed with the berries boiled in wine is made black.’English Elder Berries, as we have seen, are extensively used for the preparation of Elder Wine. French and other Continental Elder berries, when dried, are not liked for this purpose, as they have a more unpleasant odour and flavour, and English berries are preferred. Possibly this may be due to the conditions of growth, or variety, or to the presence of the berries of the Dwarf Elder. Aubrey (1626-97) tells us that: ‘the apothecaries well know the use of the berries, and so do the vintners, who buy vast quantities of them in London, and some do make no inconsiderable profit by the sale of them.’ They were held by our forefathers to be efficacious in rheumatism and erysipelas. They have aperient, diuretic and emetic properties, and the inspissated juice of the berries has been used as an alterative in rheumatism and syphilis in doses of from one to two drachms, also as a laxative in doses of half an ounce or more. It promotes all fluid secretions and natural evacuations. For colic and diarrhoea, a tea made of the dried berries is said to be a good remedy. Almost from time immemorial, a ‘Rob’ (a vegetable juice thickened by heat) has been made from the juice of Elderberries simmered and thickened with sugar, forming an invaluable cordial for colds and coughs, but only of late years has science proved that Elderberries furnish Viburnic acid, which induces perspiration, and is especially useful in cases of bronchitis and similar troubles. ‘Syrup of Elderberries’ is made as follows: Pick the berries when throughly ripe from the stalks and stew with a little water in a jar in the oven or pan. After straining, allow 1/2 oz. of whole ginger and 18 cloves to each gallon. Boil the ingredients an hour, strain again and bottle. The syrup is an excellent cure for a cold. To about a wineglassful of Elderberry syrup, add hot water, and if liked, sugar. Both Syrup of Elderberries and the Rob were once official in this country (as they are still in Holland), the rob being the older of of the two, and the one that retained its place longer in our Pharmacopoeia. In 1788, its name was changed to Succus Sambuci spissatus, and in 1809 it disappeared altogether. Brookes in 1773 strongly recommended it as a ‘saponaceous Resolvent’ promoting ‘the natural secretions by stool, urine and sweat,’ and, diluted with water, for common colds. John Wesley, in his Primitive Physick, directs it to be taken in broth, and in Germany it is used as an ingredient in soups. An old prescription for sciatica (called the Duke of Monmouth’s recipe) was compounded of ripe haws and fennel roots, distilled in white wine and taken with syrup of Elder. Elder is the focus of a rich wealth of folk lore, and has many magical associations. The name ‘elder’ derives from the Anglo-Saxon word aeld, meaning fire. This may have arisen from the practice of using the hollow stems of the elder as bellows to encourage fires. It was, however, extremely bad luck to burn elder wood; if this happened the Devil was said to appear, explaining another local name ‘Devil’s wood’. Conversely it was said to keep the Devil away if planted close to a house. Some of these old superstitions linger today; many modern hedge-cutters refuse to attack an elder for fear of bad luck. The hollow branches are the origins of yet another (this time Scottish) name ‘bour-tree’; bour means pipe. Soon the much-maligned tree became synonymous with the Devil himself. Many feared to burn elder-logs for fear they would “bring the Devil into the house.” Aubrey tells an amusing story about this, concerning a “good old gentleman’’ called Mr. Allen, who was reputed to be a sorcerer. This gentleman acquired a watch in the days when such instruments were rare. When a couple of maids; entered his room and heard the watch ticking in its case, they thought it must be his familiar or even the Devil himself. They took it by the chain and threw it out the window into the moat, hoping to drown him. But by chance, the chain caught on an elder tree that was growing out of the bank, which confirmed their opinion that it was indeed an instrument of the Devil! Fortunately, this meant Mr.. Allen got his watch back again. In other parts of the British isles the elder was less feared, but still retained its magical associations. If the eyes are bathed in the green juice of the wood, you might see fairies and witches. If you stand under an elder-tree at Samhain in Scotland, you can see the faery host riding by. Elderberries plucked on Midsummer’s Eve confer magic powers. In the Isle of Man, elders are the main dwelling-place for elves. Unfortunately, the Elder-Mother, who had probably once been a powerful female figure venerated for the healing properties of her tree, became feared as a witch in Christian times. In Ireland, witches were thought to use elder boughs as magic horses, while in England the crooked-branched tree was thought to be the form of a bent old witch, who would bleed if she were cut. A folk-tale about an elder-tree witch from Somerset is worth repeating here. It tells of a farmer who discovered his cows were being milked by a witch disguised as an elder-tree. The farmer loaded his gun with a silver bullet to shoot her, but missed, and the witch chased him back to his cottage. He hurtled in through the front door and his wife shot the iron bolt, but the farmer’s coat-tails were caught in the door and he struggled pathetically there while the witch prowled around outside! Luckily, the old granny saves the day. She takes “a girt shovel of burning coals and she say to the girl, ‘Open the back door wide!’ And she did and ran back to her mother, but the old Cranny she just stood there, and when the elder-tree came straight at her, and a-leaping and a-skreeking, she just up and throw all they red-hot coals at her, and come in and shut the back door. Then they all see blue flames flicker and hear tree crackling into cinders. The king became the lone stone known as the King Stone, while his men huddle together as “The Whispering Knights”, a group of five stones to the east. The stone circle itself is known as the Kings’ Men. The twelve apostles they were standing by, Their roots in the river, and their leaves in the sky, The beasts all thrive wherever they be. But Judas was a-hunged on an elder tree. It is reputed that it is never struck by lightning in a storm in fear of reprisal. In some parts of Scotland it ranked only second to rowan in its ability to ward off evil spells and witchcraft. Crosses made of elder twigs hung over stables and barns to protect the livestock. Drivers of hearses carried whip-handles made of elder to ward off evil influences. In Ireland elder was a sacred tree, and it was forbidden to break even one twig. Also in the Isle of Man, an elder tree outside the cottage door actually kept witches away, according to a Manx folk-tale called, “Old Nance and the Buggane.” In other places too it was viewed favourably as a benevolent, protective tree. A 17th century manuscript gives a recipe for a protective ; amulet made from plucking an elder twig in October just before the full moon. The wood between the knots must be cut into nine pieces, which are bound in a piece of linen and hung around the neck so that they touch the heart. They hang there until the thread breaks, at which point the amulet has to be buried where it may not be found. In Russia, an Elder tree in this position was thought to ward off unwanted or evil spirits. With this in mind it is somewhat strange that English folklore suggests the elder tree is a favourite form for a witch to take, and if its branches were cut then the witch would bleed. It has also been said that a death in the family would follow the burning of an elder tree, and gypsy folklore warns of bad-luck if its wood is used as kindling. Of all the Forest spirits only the ‘Hylde-moer’ (Elder mother) or ‘Hylde-vinde’ (Elder Queen) it is said was able to mend any injuries effected upon Elder trees. She was a ‘Waldgeister’, a type of spirit that inhabited the forest in large numbers. Like all Waldgeisters, Hylde-moer was kind natured, and the only forest spirits to know the power and formulae for medicinal plants. Before cutting down an Elder tree is was said that permission had to be asked for and granted from her to avoid misfortune. Shakespeare, in Cymbeline, referring to it as a symbol of grief, speaks slightingly of it as ‘the stinking Elder,’ yet, although many people profess a strong dislike to the scent of its blossom, the shrub is generally beloved by all who see it. In countrysides where the Elder flourishes it is certainly one of the most attractive features of the hedgerow, while its old-world associations have created for it a place in the hearts of English people. In consequence of these old traditions, the Elder became the emblem of sorrow and death, and out of the legends which linger round the tree there grew up a host of superstitious fancies which still remain in the minds of simple country folk. Even in these prosaic days, one sometimes comes across a hedge-cutter who cannot bring himself to molest the rampant growth of its spreading branches for fear of being pursued by ill-luck. An old custom among gypsies forbade them using the wood to kindle their camp fires and gleaners of firewood formerly would look carefully through the faggots lest a stick of Elder should have found its way into the bundle, perhaps because the Holy Cross was believed to have been fashioned out of a giant elder tree, though probably the superstitious awe of harming the Elder descended from old heathen myths of northern Europe. In Cole’s Art of Simpling (1656) we may read how in the later part of the seventeenth century: ‘in order to prevent witches from entering their houses, the common people used to gather Elder leaves on the last day of April and affix them to their doors and windows,’ and the tree was formerly much cultivated near English cottages for protection against witches . The use of the Elder for funeral purposes was an old English custom referred to by Spenser, ‘The Muses that were wont green Baies to weave, Now bringen bittre Eldre braunches seare.’ ——-Shepheard’s Calendar – November. In Denmark we come across the old belief that he who stood under an Elder tree on Midsummer Eve would see the King of Fairyland ride by, attended by all his retinue. Folkard, in Plant-Lore, Legends and Lyrics, relates: ‘The pith of the branches when cut in round, flat shapes, is dipped in oil, lighted, and then put to float in a glass of water; its light on Christmas Eve is thought to reveal to the owner all the witches and sorcerers in the neighbourhood’; and again, ‘On Bertha Night (6th January), the devil goes about with special virulence. As a safeguard, persons are recommended to make a magic circle, in the centre of which they should stand, with Elderberries gathered on St. John’s night. By doing this, the mystic Fern-seed may be obtained, which possesses the strength of thirty or forty men.’ This is a Styrian tradition.